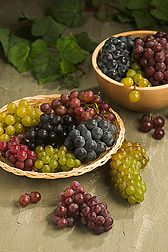 These colorful grapes from the Plant Genetic Resources Unit grape germplasm collection in Geneva, New York, are from hybrid varieties selected for their cold hardiness and disease resistance. The diversity of fruit colors and shapes in this sample reflects unseen variety in flavors, aromas, texture, and nutritional compounds. ARS is breaking new ground in grape research in New York’s Finger Lakes region, whose storied history with viticulture and the wine industry dates back to the 1850s. 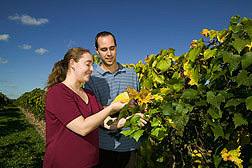 Scientists with ARS’s recently established Grape Genetics Research Unit (GGRU) in postcard-pretty Geneva, New York, study the full gamut of grapes grown in the United States, including those grown in California’s semiarid valleys and in northeastern states that experience cold winters. The new unit works closely with ARS’s Plant Genetic Resources Unit (PGRU), which is also in Geneva and which is an integral part of the National Plant Germplasm System. PGRU preserves and safeguards about 20,000 samples of cold-hardy grapes, apples, tart cherries, and vegetables, and has more than 1,200 accessions of Vitis—about one-third of ARS’s total grape collection—planted in its vineyards. It’s in Geneva that plant geneticist Christopher Owens discovered something about the genetics that determine color, one of the most important grape characteristics. 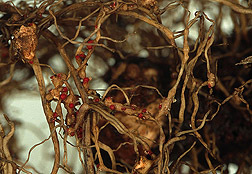 Grape roots infected with root-knot nematodes. The galling and swelling of the roots are symptoms of nematode infection. The red dots are nematode egg masses, stained for easy visualization. 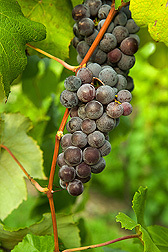 Working with geneticist Patrice This of INRA—for Institut National de la Recherche Agronomique (The National Institute of Agricultural Research)—in Montpellier, France, Owens expanded on independent 2004 research in Japan that identified a genetic mutation known as Gret1 as responsible for white-skinned grapes. Owens examined far more cultivars—hundreds as opposed to about a dozen, he says—than the Japanese researchers did. In addition to verifying those findings, the Geneva group studied grape cultivars’ VvmybA1 genes for clues that hint at what promotes different-colored grapes. 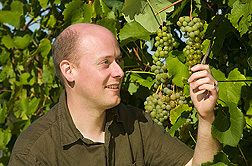 In Geneva, New York, geneticist Christopher Owens examines grapes for ripeness. “We found that variations of this gene, spurred by mutation and movements of transposable elements, cause a large proportion of color variation in modern grape cultivars,” says Owens. Other veins of grape research in Geneva entail protecting vines against threats such as aggressive nematodes and fungal diseases. 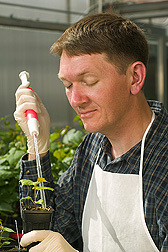 Geneticist Peter Cousins inoculates a grape seedling with an aggressive root-knot nematode strain. Seedlings that are resistant are candidates for use as rootstocks. The past decade has seen emergence of aggressive root knot nematodes (Meloidogyne spp.) that overcome the natural defense mechanisms of grape rootstocks such as Freedom and Harmony, which are known for their resistance to these microscopic worms. “These nematodes have greatly affected California grape growers,” says plant geneticist Peter Cousins. The goal, he says, is to develop and introduce rootstocks that are both resistant to the tougher nematodes and adaptable to California viticulture. Seedlings grown in greenhouses at Geneva are screened with a technique he and University of California-Davis scientist Andy Walker developed that involves inoculating month-old seedlings with 1,500 young, aggressive root-knot nematodes. So far, Cousins’ group has planted more than 200 resistant selections in the vineyard. They’ve also evaluated germplasm and found two accessions that tested completely resistant to aggressive strains. A cold-hardy, disease-resistant hybrid from the grape germplasm collection. Geneticists at ARS’s Grape Genetics Research Unit are investigating this plant’s genes that allow it to adapt to frigid winters and humid summers in hopes of later developing varieties for the Northeast. The team has also scored an important finding in work focusing on the gene in grapes—known as N—that allows them to resist Meloidogyne. Specifically, the group studied an accession of V. mustangensis called DVIT1842 that fends off all root-knot nematodes, including the new aggressive strain. Laurie Boyden, a Cornell University doctoral student working with Cousins, discovered that the gene conferring this accession’s resistance to nematodes was not a variation of the N gene, but a different gene altogether. “There are now two known genes for root-knot nematode resistance in grapes, and it may be possible to breed both genes into the same rootstock—a technique known as ‘pyramiding,’” says Boyden. This strategy could provide better protection if the two genes act in different ways or if their interaction makes them more effective. Geneticist Amanda Garris and plant pathologist Lance Cadle-Davidson examine differences in growth and development in two plants in the USDA Cold Hardy Grape Collection. A genetic difference caused the plant on the left (with yellow leaves) to go dormant before the one on the right, a natural variation that could be used in future grape improvement. Meanwhile, fungi that can cause diseases and cripple grape production are the targets of work led by GGRU plant pathologist Lance Cadle-Davidson. He has his sights set on thwarting Botrytis cinerea, which causes gray-mold disease, and Uncinula necator, the fungus that causes powdery mildew, through a better understanding of how plant development affects disease susceptibility. Gray-mold disease, which on grapes is known as Botrytis bunch rot, affects most vegetable and fruit crops as well as many shrubs, trees, flowers, and weeds. Powdery mildew hampers vine growth and fruit yield and degrades fruit quality and a vine’s ability to survive the cold. In one project, Garris and South Dakota State University researcher Anne Fennell are identifying genes involved in grapevines’ perception and response to the shorter day lengths of autumn. These high expectations are rooted in part in preliminary plans to build a new grape research facility in Geneva that will include laboratories and greenhouses.—By Luis Pons, Agricultural Research Service Information Staff. This research is part of Plant, Microbial, and Insect Genetic Resources, Genomics, and Genetic Improvement (#301); Plant Biological and Molecular Processes (#302); Plant Diseases (#303); Crop Protection and Quarantine (#304); and Crop Production (#305), five ARS National Programs described on the World Wide Web at www.nps.ars.usda.gov. Christopher Owens, Peter Cousins, Lance Cadle-Davidson, and Amanda Garris are in the USDA-ARS Grape Genetics Research Unit, 630 W. North St., Geneva, NY 14456; phone (315) 787-2244, fax (315) 787-2339. "In New York's Finger Lakes Region—A Focus on Grape Genetics" was published in the April 2006 issue of Agricultural Research magazine.